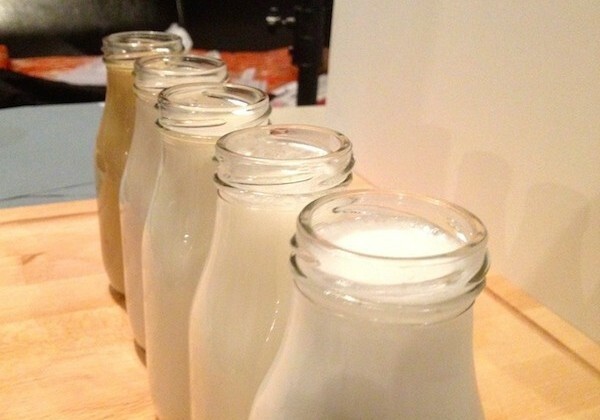 Milk no longer comes solely from cows. Sometimes it comes from nuts, seeds and even grains. Jillian Panzella navigated the modern dairy case in September’s More Milk Please and it was up to Graphic Designer Rebecca Canese to photograph those different milks. After buying out the milk aisle at Whole Foods, Canese went to work making sure the different shades of white showed up in photographs and the milk remained as frothy as possible. First though she had to transform the office seating area into a mobile photo studio. Then she went to work photographing the milk under different lighting conditions and from as many as angles as possible. Let’s just that by the time she was done the milk wasn’t something anyone wanted to drink.